Super hot Memphis Rockabilly two sider and with great alternate take of Rakin' And Scrapin'. This collector item comes in a ultra cool picture sleeve! 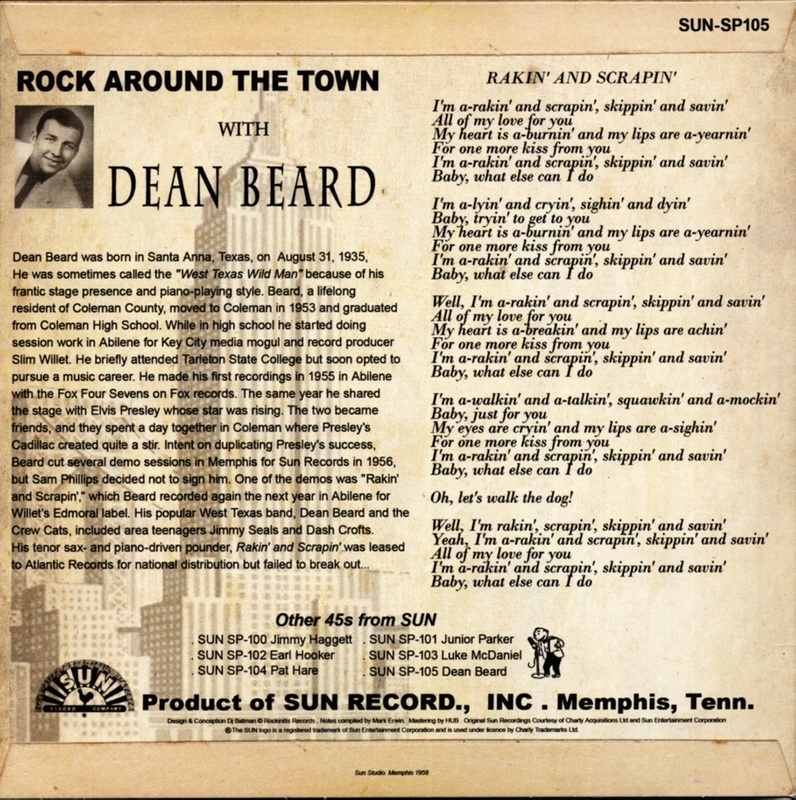 DEAN BEARD was born in Santa Anna, Texas on August 31, 1935 and grew up in Coleman where his father was a produce wholesaler. He auditioned at Sun in March 1956 and cut two sessions but never saw a release. The fact that he asked Sam Phillips’ girlfriend-secretary out on a date probably did little to improve his chances. 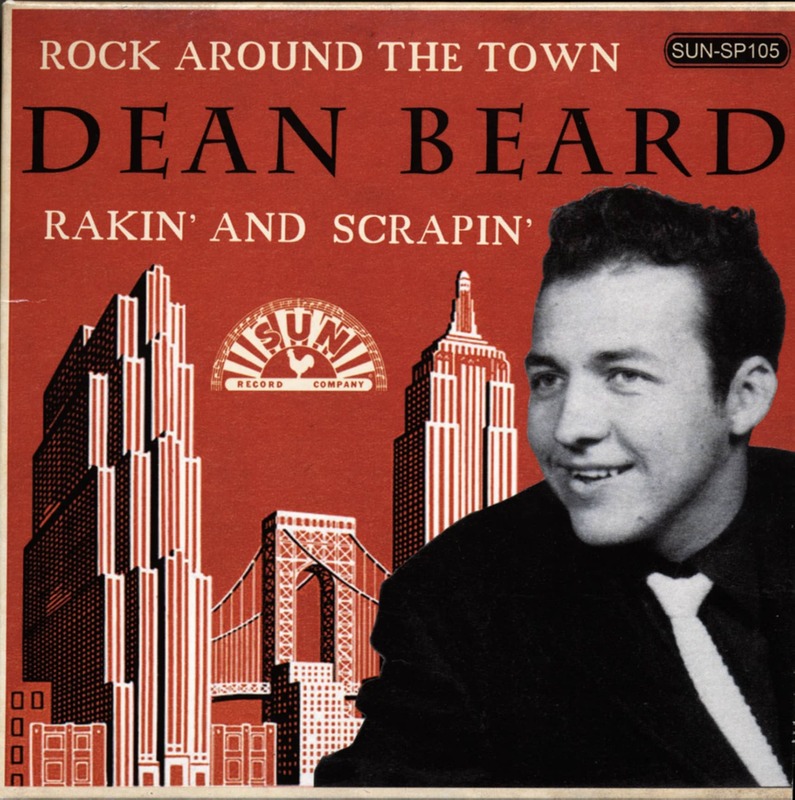 Rakin’ And Scrapin’ was written by Dean with veteran country songwriter/entrepreneur Slim Willet (the writer of Don’t Let The Stars Get In Your Eyes) and Ray Doggett (‘Elmer Ray’ in the credits). The musicians were James Steward on guitar, Jimmy Seals on sax, Johnny Black on bass, and drummer Johnny Bernero. It was Willet who later placed Dean with Atlantic Records (where Rakin’ finally made it onto a single), and with the Champs. Beard was brought into the Champs as a chaperon for Seals and Croft, and subsequently cut eight singles for the Champs’ label, Challenge. An unissued Challenge cut, Shiverin’ And Shakin’, continued the Rakin’ And Scrapin’ theme. Beard died in Coleman on April 4, 1989 after a long debilitating illness. Customer evaluation for "Rock Around The Town b-w Rakin' And SCrapin 7inch, 45rpm"